Deficts? California protests? No problem! Just cozy up to Obama, and then start selling assets. It's California's version of the yard sale! And isn't that how Wall Street works? Meredith Whitney always mentioned these yard sales. Except on these yard sales, everyone shows up! And they bring cash. And lots of it! 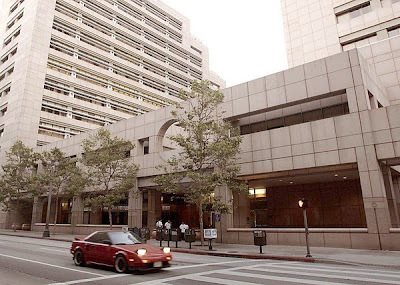 California will pay $12.2 million a year in rent, for the next 20 years for the Ronald Reagan building, and then CA will retire $1.35 billion of bonds that were going to be used to build further office building that won't be needed because of the yard sales. And the deep pocketed real estate investors will buy the properties from the State of California at th ebottom of the cycle, and of course, when times get good, CA will buy back the properties when the prices are much higher!